I have to admit, I haven’t met a salad that I didn’t like, yet. Actually I try to stay away from those weird salad combinations but every once in a while the better half makes one, like pasta or quinoa and then I really have to get creative… or surrender. We definitely like different things and for that reason (and that alone :P) I have been known to do a little cooking here and there. Don’t get me wrong, I have nothing against pasta, quinoa and some other things that don’t come to mind now, I only think that a once a year dish is definitely more than enough but things don’t always go the way you want them. So if you find yourself cornered with some dish that you really don’t want to touch, this recipe is the easy way out and will help you successfly avoid the ’round the globe guilt trip, if you know what I mean. Salad is fresh and does not require any special ingredients and the colors alone will generate that “OMG it’s so cute” thing that usualy signals the end of hostilities. On a different note, I had the chance to use parsley and cilantro that I have been growing since forever in my yard/garden, which was pretty cool, but this is another story for another time. For now just enjoy it and as always, I welcome your comments… I think! Pretty easy. 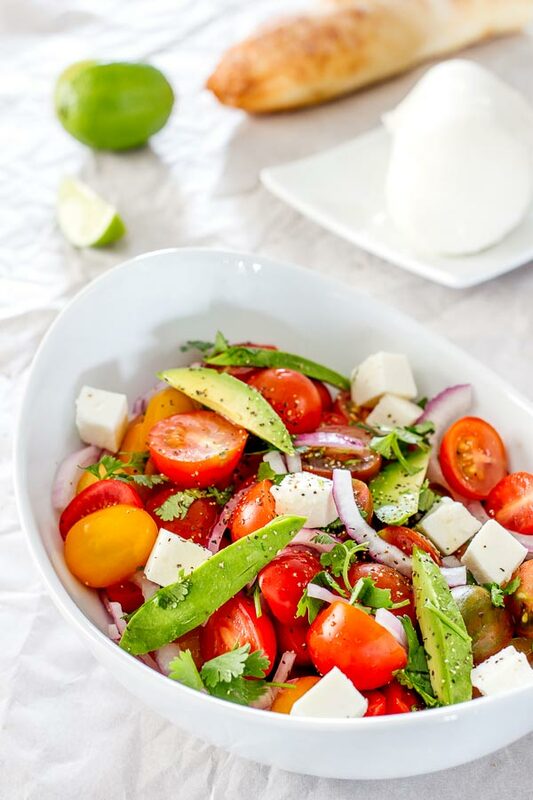 Chop, slice everything then add tomatoes, onions, cilantro and cheese to a bowl and sprinkle the olive oil; season with pepper and sea salt and toss well to coat. Top with slices of avocado and serve cold.